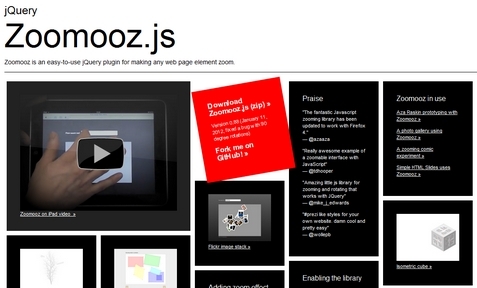 Zoomooz.js is an easy-to-use jQuery plugin for making any web page element zoom. You can easily add the zoom effect by adding the class “zoomTarget” on any HTML elements. The zoom can be reset by clicking the body. It has been tested on Internet Explorer 9, Safari 3+, Firefox 3.6+, Opera and Chrome. However, it does not work with older version of IE. And it requires a separate css file. Transforming elements with text content in Opera is buggy as well. jquery plugin that seemed very good, I’m using the plugin, thank you! Jquery is the best of all!